February has been an exciting month for Singapore as we are presented with the government’s roadmap for the next two decades or so. Many citizens, workers and businesses alike are compelled to discuss the recommendations in the White Paper on Population and how they will affect our collective livelihood. Some say there’s trouble in paradise. Does it still make sense to have a presence here? Will the government close the tap on foreign talent completely? Find out more in this issue. New Year Promotion Ending soon! This newsletter is available for download in PDF format. 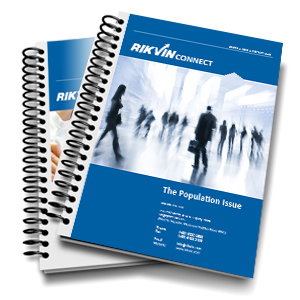 Download RIKVINConnect’s February 2013 Issue. To receive our latest newsletter and updates via email, please subscribe to our mailing list. If you have any feedback on this issue or want to share your ideas for upcoming issues, let us know at info@rikvin.com.